The most popular article ever written on this site was a comparison of the best Smart Journal apps. I limited that comparison to apps that allow usage both on mobile and desktop as well as several other criteria. I felt it was necessary to have that flexibility. But in Daylio I’ve found a hybrid app that tracks my mood and activities and have seen several benefits over a traditional Journal. There are already some great in depth reviews of the app that I will reference below but i’ll focus on a few unique aspects that I found to be great that may not have been covered. Using one of the aforementioned Smart Journal apps (For example Journey below) can feel a bit overwhelming. You basically have a blank slate for writing which you can supplement with items such as location, media, weather and other metadata. I struggled to journal daily feeling the pressure of filling that open canvas with text. 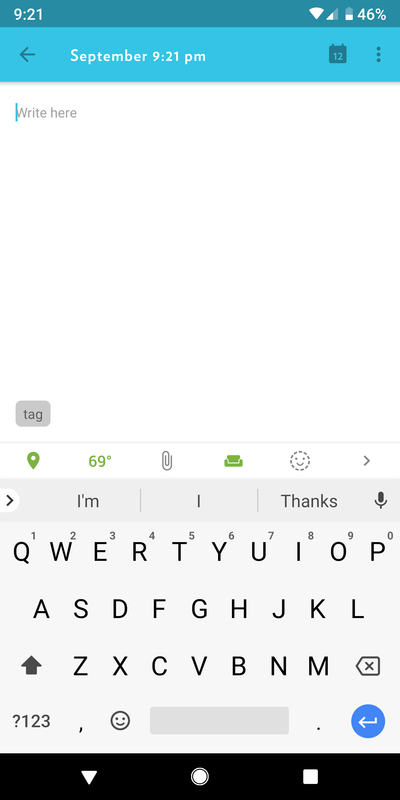 Daylio gives me a concise prompt every day that is very simple to complete and I can optionally add text in small field if I want but it’s not required. I usually just add high level details to support the activities and mood I selected. Also, by doing this on mobile it’s easy to dictate using my voice. This has made it very easy for me to consistently add daily entries. 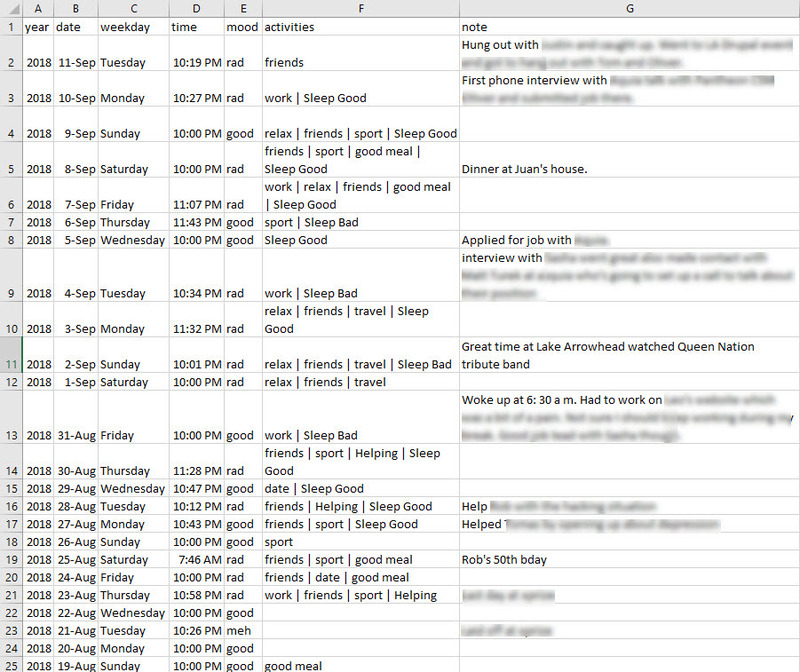 Besides its ability to add custom activities, I added 2 activities to track quality of sleep by adding “slept good” and “slept bad” activities. With this I can both see how my sleep quality may affect my mood and other activities as well as compare that to my Fitbit sleep data to see if I can find any correlations. I’m sure there are other positive / negative activities that would be useful to add as well. 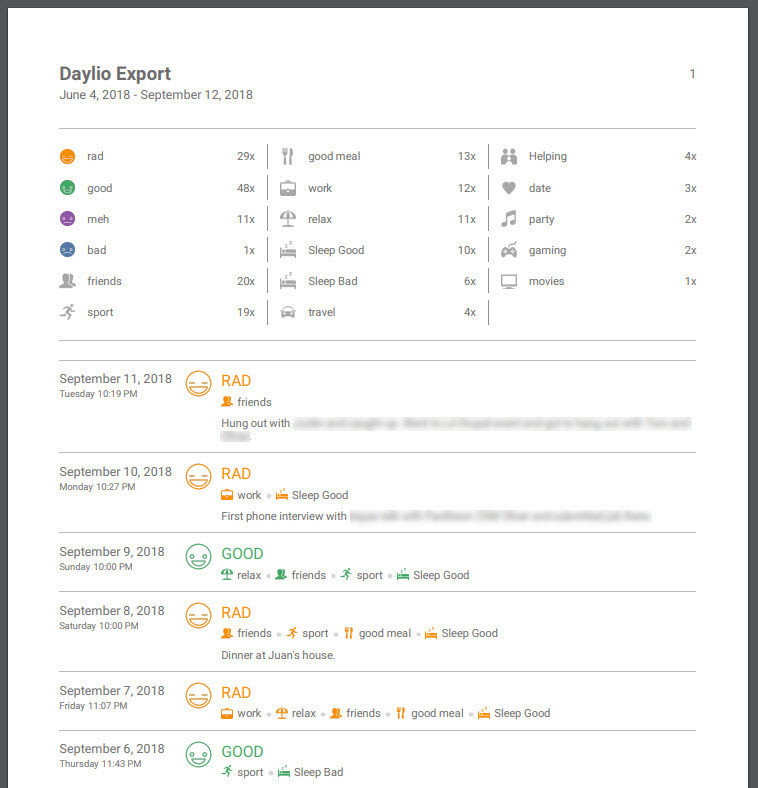 Daylio has excellent statistics provided in their reporting features which is where the app really shines. You can easily view your mood over time in nice visual reports as well as filter the data by individual or multiple data points to find correlations. Here’s a good review regarding this which also has many screenshots. As being someone who wants the ability to have an external archive of my data, I was happy to see that Daylio offers exports in both PDF and CSV formats. The exports are also very good with the PDF report displaying the data similarly to the app and the CSV providing all relevant data in a clean column output. I had tried another mood tracking app in the past. I loved the simplicity but just having a single data point wasn’t very valuable. By adding activities as well as text, the additional context really adds value and provides a way to review how you’re doing over long stretches of time. Mood-quantification applications can be useful in many ways. People who suffer from mood disorders such as depression, bipolar and anxiety can use such applications to have better understanding of their moods, for example, which activities trigger negative moods. Mood quantification can also help those who want to understand how a certain medication is affecting them. 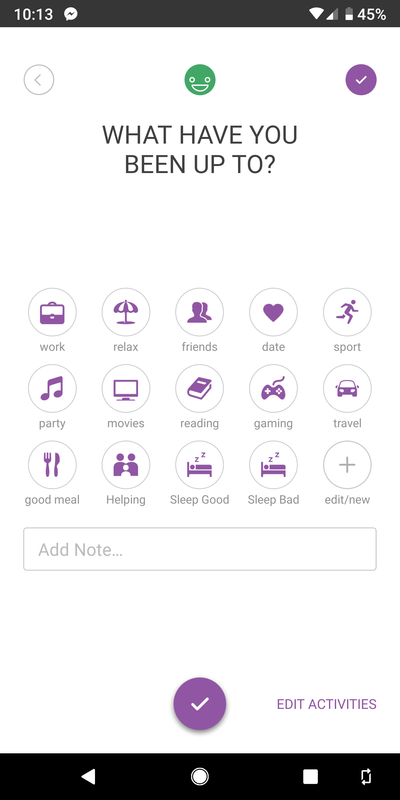 Women who want to track their moods and behaviors around their monthly cycles can also use this application. Finally, patients can share their mood data with their providers for diagnosis and better treatment decisions. Applications like Daylio may have several limitations but their simplicity can help people generate useful data that can lead to better understanding of problems and issues in the long run. I’m really enjoying Daylio and highly recommend trying it out if any of this resonates with you.